Delaware has clinched the #2 seed in the CAA tournament and George Mason can clinch the #3 with a win Saturday or a James Madison loss. As you can see from the projected bracket below the #3 seed is a bit more favorable than the #4 seed. It's very difficult to imagine George Mason winning three games in row next weekend but no one has really looked all that dominate this year in the conference. The favorite Northeastern, has recent losses to UNCW and Delaware and needed overtime to beat Georgia State on Wednesday night. Delaware is probably the hottest team right now and have won six of their last seven. Their only loss during that stretch was a one-point decision against James Madison and all the rest were either one or two point games. 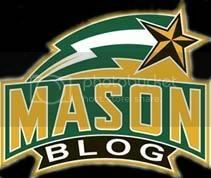 George Mason is currently slumping into the end of the season. Sherrod Wright seems worn out, the efforts on the defensive end have gotten worse, and the rotation continues to be inconsistent. Certain things that Paul Hewitt had said earlier in the year they would "figure out", have been exactly the same. We would need to see a different attitude from this group for them to win the CAA championship. If they look at it as a chance to start fresh and out-work other teams they will have just as good a chance as any other team. The big difference from the beginning of the season is that Erik Copes and Jonathan Arledge might have to carry this team instead of Sherrod Wright.